Growing up Jennie Dembowski loved the smells of Mexican bakeries. 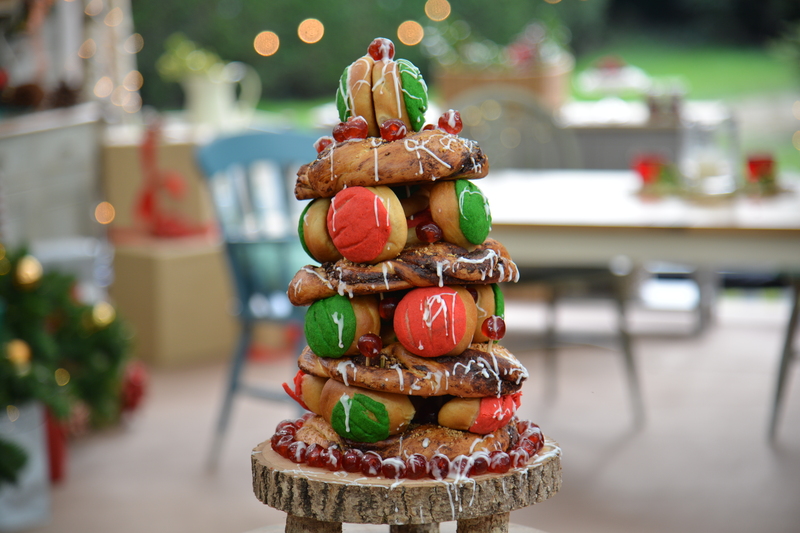 She draws inspiration from that cherished memory and uses her favorite Mexican sweet buns to create a Sweet Christmas Tree Recipe for the "Bread Week" showstopper bake. The tree is constructed with chocolate and concha buns. As this is a tall tree she used a dough that is not quite as enriched to make sure her tree will stand tall. Watch the full "Bread Week" episode from Season 2 Episode 3 of The Great American Baking Show and check out her recipe below. 2. PLACE OVEN RACK IN PROOFING DRAWER. 3. Combine flour, salt, and sugar together in the bowl of a stand mixer. 4. Mix water and milk then whisk in yeast. Let sit for 5 minutes then add to flour mixture along with melted butter. Mix until dough becomes shaggy (about 1-2 minutes), then let dough rest for 5 minutes. 5. Mix dough for an additional 5-8 minutes or until dough is soft and supple. Transfer to a lightly greased bowl, cover in plastic wrap, and proof for approximately 1 to 1-½ hours. 6. START MAKING CONCHA BUN DOUGH WHILE THIS IS PROOFING. 7. Towards the end of the proofing stage make the chocolate filling by melting the butter and chocolate chunks together, then whisk in powdered sugar, cocoa, espresso powder, and vanilla extract. Add finely chopped toasted walnuts. Layer 1, bottom: roll into flat rectangle 4" W x 12" L and approximately 0.5" thick. Add chocolate filling then roll into 1" to 1.5" thick log. Cut log lengthwise in half and twist halves into rope form. Roll into loose 7" wide coil/circle. Set aside and cover with plastic wrap. Layer 2: Repeat process and roll into 6" wide coil. Layer 3: Repeat process and roll into 5" wide coil. Layer 4: Repeat process and roll into 4" wide coil. Layer 5: Roll ball of dough into star or oval shape for top of bread structure. 6. Proof shaped bread for 45 minutes or until dough has puffed. 7. Brush with egg wash and bake at 350º F /180º C for 30 minutes or until internal temperature reaches 190º F TO 200º F.
2. Whisk yeast and water together in bowl of stand mixer. Add coconut milk, sugar, butter, salt, cinnamon, vanilla, egg, 2 cups of flour, and mix until dough is combined. 3. Add remaining flour and knead with dough hook or by hand until dough becomes smooth and elastic (about 5-8 minutes). Place dough in large bowl, cover with plastic wrap, and let rise in warm area for 1 to 1-½ hour. 4. While the dough is rising prepare the topping by mixing sugar and butter until fluffy and fully incorporated. Slowly add flour, cinnamon, and extracts and mix until paste forms. Divide dough into two portions. Color one portion red and the other portion green. Keep wrapped in plastic wrap until ready to use. 5. After first proof, turn dough out onto surface and divide into portions approximately 35 grams each and gently form into balls. Cover with plastic wrap while getting ready to roll the sweet topping. 6. Roll out the sweet topping paste between two pieces of plastic wrap. Cut into circles with round pastry cutter, and score three times to create traditional clamshell. Place cutouts on top of dough balls and gently press into place. 7. Cover with plastic wrap and let rise for approximately 45 minutes. 9. Check temperature of bread - internal temperature should be 190º F.
1. Place layer 1 (bottom layer) of chocolate-filled bread onto display base. Insert shish kabob stick through front, back, left, and right sides of bread, then insert concha buns (face side out) on top of each shish kabob stick. Insert layer 2 of bread on top of concha buns on shish kabob stick. Repeat process with remaining layers. 2. One structure is assembled mix 3 cups powdered sugar with up to 5 tbsp milk to create a glaze. Drizzle on top of bread structure and apply candied cherries throughout. The Great American Baking Show: Holiday Edition has been added to My List.